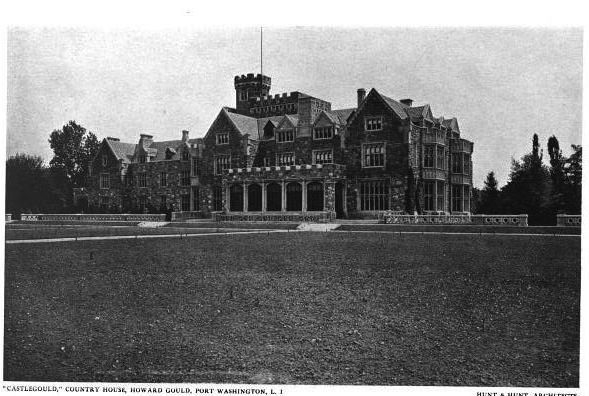 'Castlegould', originally the Howard Gould estate designed by Hunt & Hunt c. 1909 in Sands Point. 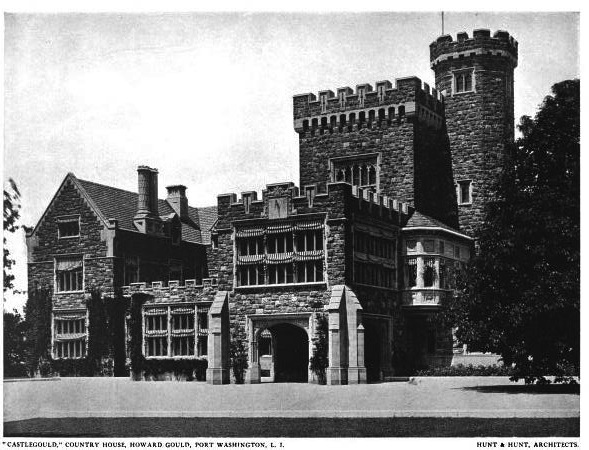 In 1917 Daniel Guggenheim purchased the estate and renamed it 'Hempstead House'. Click HERE for more on 'Hempstead House' and to see how it looks today. Click HERE to see the estate on google earth and HERE on bing. Interiors to follow tomorrow. First, I'm grateful this house has survived & is being maintained. Having said that I'll repeat an earlier comment (not by me) that Richard Howland Hunt did not inherit his father's talent. It's a good design & floor plan; but not great. Comparing this house with his 'Idle Hour' I notice RH Hunt seems to have liked having you enter a house looking directly at a heavy staircase & a wall; not my first choice. P.S. The news story attached to his wiki page is priceless. The man marries an alcoholic actress who is also Buffalo Bill's long-time mistress and he expects what exactly? Why Ancient, it's clear that he expected to make an honest woman of her (that was such a great, albeit wrong, expression). But Howard Gould didn't want to marry a woman who was honest in the first place; I suspect because they weren't as "interesting." & like soooo many other men ... Howard Gould paid a price. According to the links on wikimapia there were two houses that he built for his wife. They refer to the first as Castlegould, which she rejected and refused to occupy. According to that account he then built Hempstead (which may have also originally been named Castlegould as Zach would know best). The first house was then converted into the stable and servants quarters. It is extant to the southeast of Hempstead House. She never occuiped either house as they divorced before Hempstead House was finished. On one hand she appears to be a real piece of work. On the other hand if the first structure was intended to be a house, she was justified to reject it. It is more fortress than house. Unbelievable combined quantity of square footage in the two structures. Equally interesting is the widow Guggenheim's smaller villa directly east of Hempstead House, which she built and occupied after her husbands death in 1930. It is incredible that all of this has been preserved. I've never been quite sure of that account. The stables don't look like a house to me. Plus I have a plan of an Augustus Allen house that was never built from I think around 1904 that I think was the one he designed for Gould. I can post later today (granted I've never dug into the history of it...just a quick assumption). I'm with Zach on this. Just because it's in print doesn't make it correct. In all contemporary accounts, the main house is known as Castlegould, and after the Guggenheim purchase. One doesn't find any account calling the stables Castlegould during Guggenheim's ownership. In early architectural magazines, they stables are referred to as the stables at Castlegould and/or the stables of Howard Gould. The Castlegould name on the stables seems to be entirely a modern invention, probably by a reporter confusing details---or one of the park bureaucrats. It wouldn't be the first time in either case. DED...will be very curious to get your thoughts on the Allen elevation I have. However..........the NY Times has a fascinating article from May 22 1904 describing the Goulds planned castle that was to be built in Sands Point. It describes a breach of contract with an architect named Haydel and Mrs Gould over completing the structure. The home was to be a replica of Ireland's Kilkenny Castle, only bigger, lol and grander, possibly making it the largest home in the US at the time. 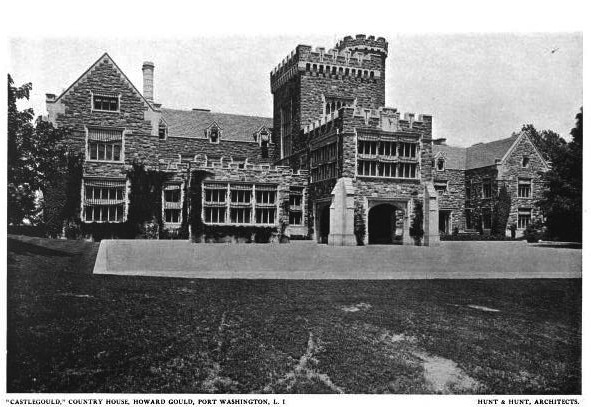 The description is very close to what the Gould stable looks like today, except for the interior being fitted out as stables and riding rink and service areas instead of a lavish home......According to the article, one would approach the castle by driveway that would lead directly into the grand tower hall. One wing would be 300' square with a large interior courtyard, Planned were massive first floor entertaining rooms, one an orangery with a double row of masonry columns and vaulted ceilings with dimensions of 40 ft by 125 ft, which sounds like the stables riding area that was ultimately built. The Gould home would have approximately 200 rooms and the owners bedrooms would take up a wing 50 ft by 300 ft. The Times article stated that the home was possibly the largest private residence to be built in the world, if completed. They have exterior elevations in the article and it looks incredibly similar to the Castle Gould structure at Sands Point. However, with the scandal of Mrs Gould and the architect, I presume that might have been reason for Mr Gould to abandon those plans and instead build the smaller 40 room Hempstead House, while turning the original structure, not yet completed into stables? Just thought the Times article put some factual evidence of the castle mystery to bed. P.S. Check the Bing view of the existing stables and you will see the enormous scale of the stable complex.......almost begs the question that this could not have been built just as a service building. The entry drive also goes through the main tower and it has three wings built of a possible 300 ft square that would have contained the interior courtyard as describled by teh NY Times. The only thing I find weird about that is the stables just do not look like a house. Check out the elevation for the Augustus Allen house I posted...same architect...now that looks like a very grand house. But if the stables were designed as the house...I dunno...epic fail. Can you link to the Times article? Another thing I don't understand...why choose a site with such massive exposure to the Sound only to build the main house inland with no water view (as opposed to the siting of the current main house...right on the water). I will try to link. I dont know if I can? The article does refer to the house as Castlegould and its description details a massive structure that was planned to be built. It details the constant changes Mrs Gould demanded and the delays in getting construction underway. I just always found it odd that the enormous stable complex literally dwarfs the main house. Hope the link is accessible. Only other answer I would have is that Castlegould was planned for the Hempstead House site. when architects changed, the plans for Castlegould or something like Castlegould were delegated to become the stables, since the blueprints were already done and it was relocated inland. The new architects got the choice waterfront site to build the smaller Hempstead House for the now divorced Mr. Gould? Would like to know the answer after all the years of speculation. PS, I left out a crucial part of my second sentence. It should read "and after the Guggenheim purchase WAS KNOWN AS HEMPSTEAD HOUSE.". Oops, I really, really, really must learn to proofread my comments. I haven't got time right now (hold those sighs of relief) to sort out Archibuff's and Zach's conversations above, my IMHO, Allen probably designed a house, the Goulds weren't satisfied, hired Hunt & Hunt instead----wouldn't be the first time. BUT, of this I am certain---the stables are the stables, and they were not known as Castlegould until fairly recently, and are not accurately known as such. As for the size of the proposed room count, etc---it would not be the first time that a newspaper in search of sensationalism wildly exaggerated or just heard rumor about the size of proposed house. JUST BECAUSE IT'S IN PRINT DOESN'T MAKE IT SO. Haydel would likely have been Abner Haydel of Haydel & Shepard, architects of the Fabbri House in NYC. In Long Island Country Houses, it clearly states that Allen was given the commission to lay out the estate in 1902, and built the STABLES in 1904. It is very clear that the Times reporter was prone to aggrandizement----or maybe saw the stable plans and mistook them for house? And, again, the earliest instance of the stables being themselves called Castlegould seems to date from the 1970's and is the product of either a reporter's or park official's, or guidebook writer's need to reconcile the two names. In short, sometimes a cigar is just a cigar. Allen laid out the estate. Allen laid out the stables. Allen did a proposal for the house in French Renaissance style which was rejected, somewhere along the line Haydel also made a rejected proposal, and Hunt & Hunt were then hired to build Castlegould, based on Kilkenny Castle. Apparently from what I've found on the subject, Mrs. Gould was not an easy client. Although this mentions that Hunt & Hunt were hired after the original architect was dismissed, it goes on to say that the original house was to have been based on Kilkenny Castle (although the drawing of proposed house Zach links to shows clearly a French chateau a la Biltmore), but that when Hunt & Hunt were hired, an 'English Country House' scheme was adopted instead. All good & well, except the completed 'English' scheme, nevertheless has a square central tower that appears to have been based on one at Kilkenny, both square with attached octagonal stair turret. I leave it to the jury to decide. The stable building, incidentally, also has features in common with Kilkenny. Forgive the many links---it's raining and I can't play outside. ""Castlegould", Messr.s Hunt & Hunt, Architects, the country house of Mr. Howard Gould, located at Port Washington on Long Island, is illustrated and described as "the most livaable large house in America," in the September issue of 'Architecture' (see previous link above). "Originally designed as a replica of Kilkenny Castle, this country house has from its inception to its completion undergone many architectural vicissitudes. "That the architects finally employed were able to bring the matter to a succesful conclusion shows creditable adaptability, but we dout if they would so sweepingly claim that this rather sombre pile represents the highest phase of domesticity in this country." hmmmmm. I also found mention elsewhere of Abner Haydel being sent abroad, but that his designs didn't please Mrs. Gould. Maybe she should have hired CPH. DED lots of good detective work but the NY Times article from 1904 states Abner Haydel had the commission after Mrs Gould saw and rejected other architects plans for her house. It states he was contracted for the job and the blueprints were almost completed after 3 years of work but it was the constant changes and delays caused by Mrs Gould that led him to basically walk off the job. The article calls the home Castelgould and by the look of the elevation drawings printed in the Times, it definitely was an enormous rustic castle structure, not at all looking like a french chateau at all. I think this particular client must have been hell to deal with but it seems that the home could have broken ground if not for the problems between client and architect. The architects hired, in order, were Allen-whose design, linked to by Zach above, was for a French style chateau. Allen also designed the stables, which were NEVER themselves called Castlegould until modern times. Then Haydel was hired, to design a copy of Kilkenny castle, which was scrapped later. THEN Hunt & Hunt, who toned the Kilkenny castle scheme down to English Country House on the ocean side, but with a 'whiff' of Kilkenny left on the front. The name Castlegould fell out of use until the last few decades when someone apparently just decided that was the name of the stables. The stables were never a house. There! Do we all agree now? Good detecting, DED; according to a society piece in the NYT, Haydel was indeed the same architect as the Fabbri house. The articles about the ongoing litigation, which the Goulds eventually lost, state that ground was never broken on what was to have been the original Castlegould (to be surrounded by a ravine converted to a moat), and the Goulds eventually were ordered to pay $30,000 in outstanding fees (against a projected $957,000 cost) after a higher court blocked a retrial (most likely because of Mrs. Gould's highhanded "...there's the door; let the damned architect go!" comment). Since Nassau County took over the property around 1971, about the time the name Castlegould resurfaced, my guess would be an over-enthusiastic docent making one of those innocent mistakes that sticks like white on rice. From the link to The Royal Magazine; this line is excellent: "The modest requirements of the English nobility could hardly be expected to suffice for an American multimillionaire; it is therefore proposed to make the castle on Long Island considerably larger than its historic original." Nice to finally have 90% of the story confirmed. Now since a lot of contemporary documentation differs with most, if not all accounts here, I presume the name "Castlegould" will not fade from use anytime soon. So three things learned; 1. The Goulds intentionally set out to build a gigantic stable/riding structure within view of their "smaller" home, dwarfing it in all ways possible, 2. That Mrs Gould must have been a real %$/*#*@, which explains the eventual divorce and number 3. this blog has some great sleuths with way too much time on their hands to uncover any shred of historical documentation floating out there on the internet. Now...my question for all of you is do I remove the estate names 'Castlegoud' and 'Hempstead House' in all previous posts and simply refer to these as the Gould or Guggenheim estates? I feel like leaving the names as is will only continue the confusion. WHEW!! I'm worn slap out. Sorry kids---Daddy goofed again (multi-tasking here), and the preceding nutty letter from Haydel was not the denouement. Nothing like throwing a good rumor into the pot to stir up a great discussion. a. Castlegould was the original estate name encompassing both the house and stables. b. Guggenheim renamed the estate Hempstead House. c. Nassau County ressurrected the name Castlegould to distinguish the stable building from the house. Their website clearly refers to "Castlegould Stable" and "Hempstead House." They also appear to be the ones perpetuating the idea that the stables are the original house. If that were the case, I agree with Zach . . epic fail. However, I have to agree with the researchers here that the stables were not built to be the house and there were three planning attempts, three architects (and a divorce) before the final house would emerge. That said, I still wonder based on Archibuff's research if the plans for the stables were adapted from the first round of plans for the house. Perhaps as a way to recoup some of the expense of those plans. Regardless, the entire site including Guggenheim's son's mansion Falaise is a refreshing preservation. That second link is the stuff of genius. I vote to keep the names Castlegould and Hempstead House to distinguish between the 2 structures and the 2 prominent families who built on this property. Also agree with Anon. that not only do we have the Gould design saga, lawsuits and society scandal and the resulting "castle like" structures, but the property also has Falaise and Mille Fleurs (Spelling?) that are beautiful homes in their own right. Plus the acreage contains numerous service buildings, wonderful stone gatehouses and some of the most massive and ornate iron entrance gates to be found anywhere. Amazing that all of it has survived. I vote to use the words 'house' and 'stable' to distinguish between the two structures. Has anyone been to the Preserve lately? Conversation months ago was organization that maintains property was NOT doing a very good job.